You’ve got to meet an urgent deadline on a project, and your wife must by all means find а promised recipe for her best friend at the same time? Or you are exchanging important business messages with your partner, and your son’s pals are impatiently waiting to chat with him? ASTER 2 computers in 1 is an affordable and convenient way to obtain another workstation on the basis of your computer (an ordinary desktop or laptop). How to connect monitor and computer? You can trial run ASTER 2 in 1 free of charge. ASTER makes it possible to save space in your flat. Absence of another system bloc makes ASTER convenient for use in small rooms. Low noise level. 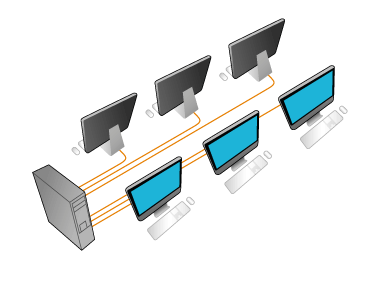 The second ASTER-based workstation does without the noisiest part of a computer – its system unit, which ensures a lower noise level in the room. There is no need for a local network. All common devices are automatically accessible from each station. Electric power is saved thanks to the system unit absence, which is the main power consumer in the computer. Lesser intensity of high-frequency radiation. One system unit in place of two blocks means a lesser dose of harmful radiation. Operating with most modern video cards.